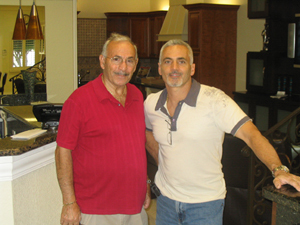 Phil Giambalvo, founder of Phil's Custom Cabinets Inc. established in 1973, began manufacturing cabinets by hammer and nails in a 1,000 sq. ft. wood working shop. Five years later he brought in his son Michael to teach him the trade. For 25 years they worked side by side. In 2002 Phil retired and Michael took over the business. The company has grown to 5000 sq. ft., 2,500 showroom and 2,500 manufacturing. The showroom consists of 7 complete kitchen displays, 2 bathrooms vanities, a home entertainment center and a large selection of hardware including sinks and faucets. To compliment your kitchen or vanity, we also carry a large range of counter tops. Each kitchen in our showroom consists of many different styles from Omega, Omega Dynasty, Homecrest, Kitchen Craft, Dura Craft, Dura Supreme and our own custom line. Our company strives on quality workmanship, quality products and our dependability, especially when it comes to customer service. Leaving every customer satisfied! Copyright © 2007, Phil's Custom Cabinet Inc.